Tarsos. Mazaios silver stater. 361-334 BC. Tarsus in cilicia. Satap Mazaios, 361-334 BC. Size : 23.0 x 24.0 mm Weight : 10.86 grams. Grade : gXF (as struck). Obverse : Baal of Tarsos enthroned left, holding a sceptre, eagle and a corn ear with a clustre of grapes, with an inscription to the right that translates to BAAL TARZ. Baal's feed are just off the edge at the bottom. 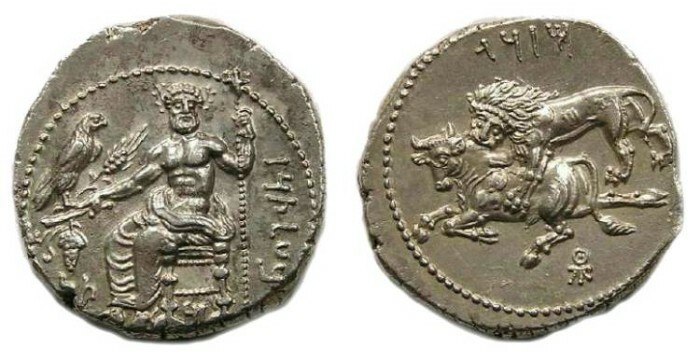 Reverse : Lion attacking a bull, with an inscription translating to MAZDAI above, with a small Greek letter monogram below. After Cilicia was conquored by Alexander the Great, Mazaios became Alexander's governor of Babylonia.